Over the past year I have had the privilege of helping you with one of the most important purchases you’ll ever make…your home. 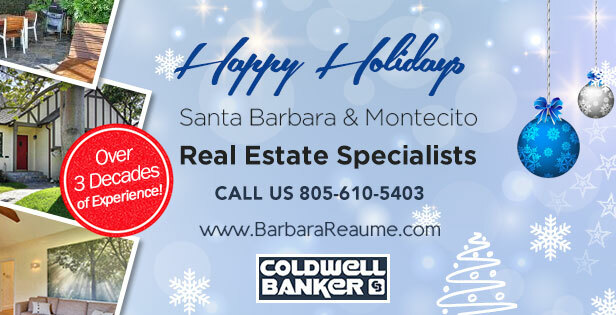 As a realtor at Coldwell Banker in Montecito I have been able to oversee my clients in the buying and selling of property in Santa Barbara, Hope Ranch, Goleta, Montecito, Summerland and Carpinteria. More than 88% of Santa Barbara home buyers start their research online. That’s why I’m glad to have helped my clients use the Coldwell Banker phone app which finds available homes in targeted areas. I am grateful for the faith you have had in me to guide you through this process. I am also thankful to those who trusted me with the sale of their homes. We were able to go over many crucial disclosures that are often overlooked. Whether you were buying or selling, 2016 was an active year for Santa Barbara real estate. Let me share several interesting statistics about the real estate market during 2016. The year saw single-family house prices in nearly 40% of 401 metro areas either at or above their pre-recession peak in the third quarter. Meantime, the price of luxury homes fell by 2.2% in the third quarter compared to a year ago. According to the Redfin report, the drop in prices may have been due to wealthy buyers and foreign investors refusing to buy at the top of the market. Despite the price drop, experts say the luxury market is healthier than it was before the crash in 2008. Whether it’s luxury homes, single-family homes, or foreclosure properties, I am happy to review all of the market trends of 2016 with you at any time. We can also look ahead to what the experts are predicting for 2017 and how it may impact you. Another fun bit of news to report; I re-launched my website last month with a brand new design. If you’re feeling in the mood, leave me a comment on the homepage Facebook box! p.s. As a resource to you, we will occasionally recommend local area partners that we feel may be of value to you. If you are moving in or out of Santa Barbara and need the help of a moving team, contact Casey at http://HazelwoodAllied.com – The Careful Movers. If you recently had one of your home appliances stop working, give our trusted appliance repair partner Burt Yost a call. For a reputable, licensed & bonded house cleaning company call Rosie’s House Cleaning Team. Q: I am over the age of 50 and need help downsizing my living space. Can you help? A: Yes. I have completed an education program offered by The SRES Council. I am qualified to counsel and offer options and information to clients age 50 and above as they go through lifestyle changes. Q: I am looking into short-sale and foreclosure properties. How can you help? A: Yes! As a Short Sales and Foreclosure Resource, I can work through the confusion that can come along with short-sales and foreclosures. Q: Does you only deal with home sales? A: No, I can also help when it comes to condos and land sales. Windham Hill Winter Solstice 30th Anniversary Concert: December 19, 2016 – Celebrate the Winter solstice at the Lobero Theatre with well-known musical names like Will Ackerman and Barbara Higbie. Ticket prices range from $39-$105. The Brian Setzer Orchestra Holiday Show: December 19, 2016 – Join Grammy-award winner Brian Setzer and his 19-piece orchestra at the Granada Theatre for a night of music to get you in the holiday spirit. Ticket prices range from $44-$89. Mannheim Steamroller Christmas: December 29, 2016 – For a quarter of a century, Mannheim Steamroller has been entertaining audiences for the holiday season. This year The Granada Theatre hosts this Grammy-award winning sensation. Ticket prices range from $34-$93. Blush Restaurant Downtown: Blush will be having a Christmas dinner celebration in downtown Santa Barbara. Blush is a cozy restaurant and lounge that will be open from noon until 10:00 p.m. You and your guests can sit back and relax while their chefs do all the cooking. Maxs Restaurant & Cucina: Known as the best breakfast restaurant in Santa Barbara, your holiday guests will love the brunch served at Max’s. Sammy’s wine tours is a great way to enjoy the area by touring around the local wineries. Get shuttled around in style and avoid a costly DUI. Qui Si Bella Spa is running a Christmas special for their day spa and massage services. Take your family and friends to the spa and get a mani / pedi! About Barbara Reaume: Realtor Barbara Reaume helps clients sell or buy a home in Santa Barbara, assists with Santa Barbara relocation needs, and provides insights on purchasing land as an investment. Visit the website at http://www.barbarareaume.com for more information on Montecito realtors. “Like” the Facebook page for insights on selling a home in Santa Barbara. Call 805-610-5403 for home buying tips or to request a quick quote. Thank you Barbara Reaume for the useful tips you have shared in this article. It is challenging to find a good real estate agent nowadays as there are a lot of people claiming to be a good one in the Internet, when in reality they are not even qualified. I am glad to have found an agent whose qualifications are legit and has a great experience when it comes to Santa Barbara real estate.